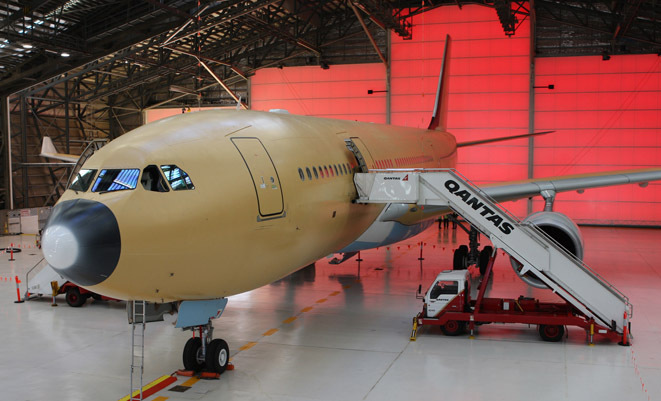 Qantas Defence’s Brisbane facility has a “bright future”, head of Qantas Aviation Services Glenn Brown has said, despite work on the final A330 to KC-30 MRTT tanker conversion nearing completion. “The Brisbane conversion centre is a Qantas facility. We’re hoping to finish work of the fifth [KC-30] later this month, following that, Qantas is hoping to expand the maintenance footprint in Brisbane with substantial commercial work,” Mr Brown said. The comments come after Airbus Military CEO Domingo Urena earlier this week said the company had yet to receive a response from the Australian government regarding its unsolicited proposal for a sixth MRTT tanker which would keep the conversion line open ahead of potential future work for other A330 MRTT customers. “This offer is still on the table, but unfortunately by the end of the month we [begin to] shut down the Qantas Defence [conversion activity], we are going to finalise how we are going to finish aircraft number five, and then unfortunately those capabilities are going to be lost,” Mr Urena said. Mr Brown said there would be a lot of work going into the Brisbane facility following the recent Qantas maintenance restructure. “We continue to chase commercial opportunities and other military MRO in the Asia-Pacific region,” he said.